The best putter ever? There’s always room for debate, but Billy Casper’s name has to be in the mix. Using what some called a pigeon-toed stance and a Golfcraft Caliente putter, now at the USGA’s Golf House in New Jersey, he needed only a record 114 putts in winning the 1955 U.S. Open at Winged Foot. Talking with Timm Matthews on The ESPN Golf Connection radio show, Casper mentioned that he spent a lot of time practicing his putting, even doing it in the dark as a youngster, and that this helped enable him to develop the touch and feel necessary for success on the green. “He’d drive a stake through your heart with that putter,” Dave Marr once said. I once heard that Ben Hogan, never one to mince words or be in the least way sensitive to the feelings of other professionals, once made the comment that if not for his putting, Casper would probably have been selling hot dogs on the 10th tee. 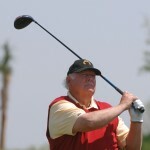 Of course, that’s not entirely true as Casper, using his self-taught swing, was also one of the game’s best in developing a strategic approach, spending more time analyzing a course than he did on the practice tee, He could get in position in the fairways with his low fade off the tee and his accurate approach shots regularly found the green. This is evident from 51 tour titles, including a Masters and a second U.S. Open at the Olympic Club in San Francisco where he overcame a seven-stroke deficit to Arnold Palmer on the back nine and beat him by four strokes in a playoff He was a member of eight Ryder Cup teams, scoring more points than any American with 23.5, and won the Vardon Trophy for the lowest stroke average five times. Definitely all the credentials needed to earn a spot in the World Golf Hall of Fame. Chatting with Bill Greene and myself, Casper offered a gem of a putting tip: “Keep the back of your left hand square to the blade at impact.” Personally, I’ve found this easier to do with my left-hand low and agree with Dave Pelz that this might not be a bad practice for juniors just starting the game. In addition, Casper looked at Tiger Woods’ recent putting woes and suggested that he just needed to “open and roll his right hand to the right” to avoid all those misses on the right side of the hole. Pointing to an obvious difference between today’s pros and those from his days, Casper noted that there is little doubt that the equipment and balls plus all the training and course conditions have made a lot of difference. “Distance is the name of the game today,” he said. . However, he doesn’t always feel that courses have to be lengthened to challenge today’s pros. “Just narrow the fairways and add more rough to put the premium on accurate tee shots,” he said. Casper doesn’t like the way that some par 5s are turned into long par 4s either, noting that most of those greens were designed for short iron or wedge approaches and couldn’t always hold the longer shots. “I never had a lesson,” he said, pointing how that has changed with all the teachers now right on the practice tees with their students. “I just learned to play all the different shots out on the course.” I got the impression that he felt today’s pros needed to do a little more of this rather than just hitting off the level lies on the range. “Back in my days, none of us had anyone like that, but everyone would virtually come to a stop to catch glimpses of Sam Snead hitting,” Casper added. Looking at Woods’ chances to eclipse Jack Nicklaus’ record of 18 majors, Casper noted that it was doubtful now with all the knee problems and the time he was missing from the game. Casper admitted that he is busier now than ever before and still enjoys playing. 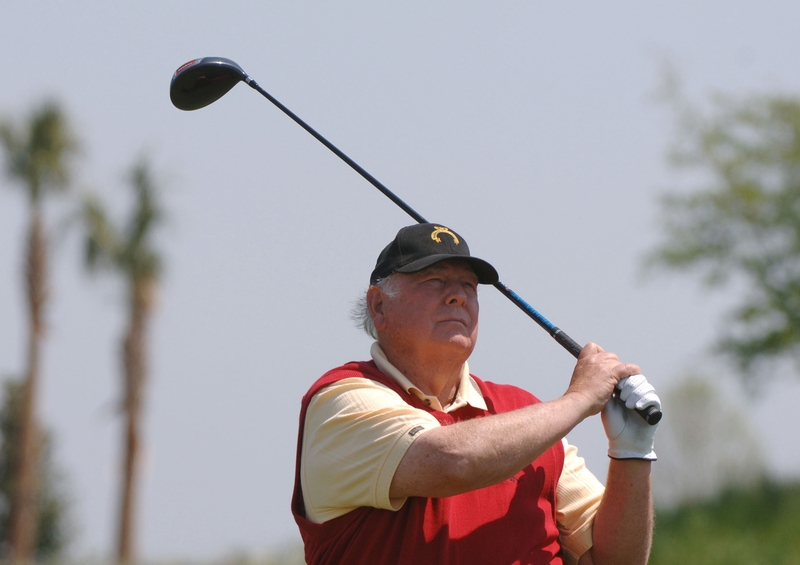 “You just won’t find me back on the black or blue tees.” He also has been spending time working with his grandson and another young player and finishing work on a book scheduled to be released in 2012.